SIG-CRD - Ceiling Radiation Damper helps to limit the radiant heat transfer through an air inlet/outlet opening in the ceiling membrane. Fire resistance rated up to 3 hours floor/ceiling or roof/ceiling assemblies. 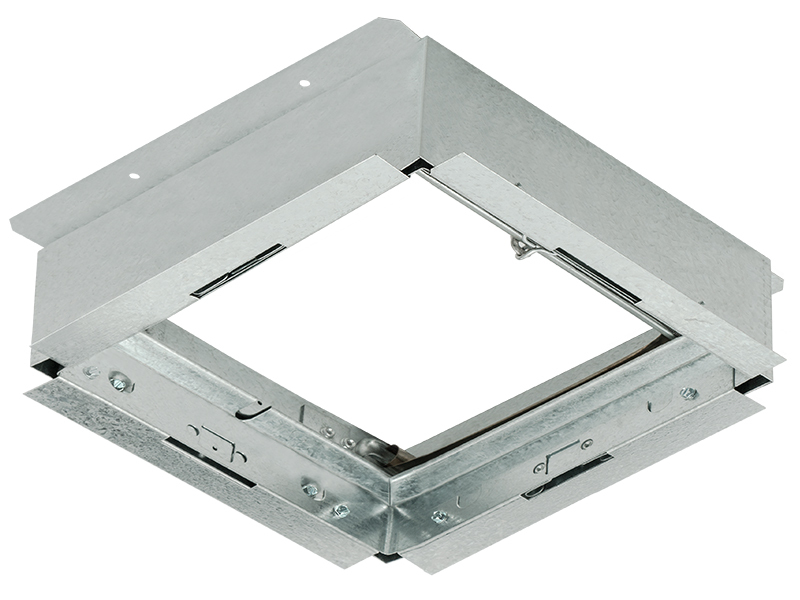 UL listed as fan/damper assembly for the following Wood Frame Construction designs: L521, L546, L558, L562, L574, L576, L581, L583, L585, P522, P533, P538 and P545. Intended for installation with the following UL Listed Delta Electronic Fan Models SIG80, SIG80D, SIG80L, SIG80H, SIG80HL, SIG80DL, SIG80M, SIG80MLED, SIG110, SIG110D, SIG110L, SIG110M, SIG110H, SIG110HL, SIG110DL, SIG110LED, SIG80-110, SIG80-110D, SIG80-110H, SIG80-110MH, SIG80-110LED, SIG80-110DLED, SIG80-110HLED and SIG80-110MHLED. The damper employs a folded curtain style blade for point-of-origin control of radiant heat in a ventilation system. SIG-CRD installs in the ceiling membrane for floor/ceiling or roof/ceiling assemblies with a re resistance rating up to and including 3 hours.